Planegg, October 1, 2015 – Clariant, a world leader in specialty chemicals, officially opened its new Group Biotechnology Research Center in Planegg near Munich today. 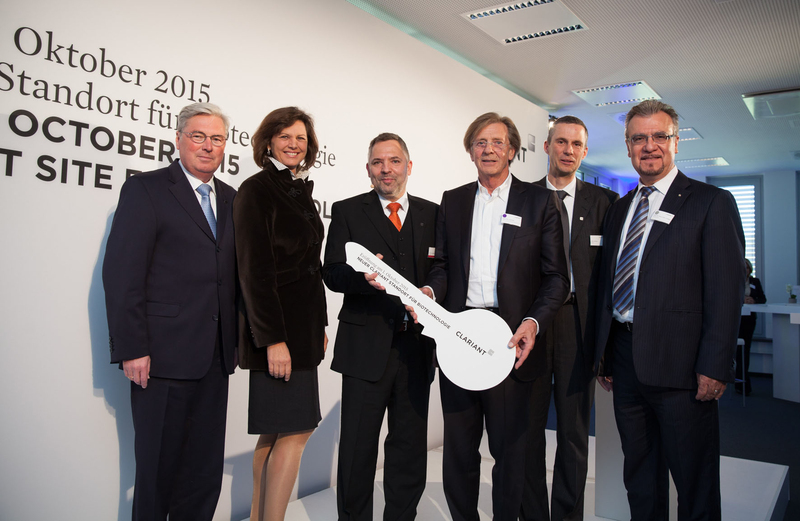 In a ceremony attended by Ilse Aigner, the Bavarian Minister for Economic Affairs, Media, Energy and Technology, the key to the facility was symbolically handed over to CEO Hariolf Kottmann and the Head of Clariant’s Group Biotechnology André Koltermann. “Alongside the Clariant Innovation Center (CIC) in Frankfurt, the new Clariant Biotech Center (CBC) is another important global research facility for our company”, emphasized Hariolf Kottmann in an address delivered to over 100 representatives from the worlds of politics and business. He went on to outline the importance of Bavaria, and in particular the greater Munich area, as a leading research and development powerhouse in the field of biotechnology. The move was prompted by an expansion of the company’s activities, with around 100 staff now employed at the CBC. The new building with its laboratory and office space of over 6000 square meters offers excellent conditions for research work. “Establishing a dedicated research center for biotechnology in its own building right at the heart of one of Europe’s biggest biotech hubs is doing far more than just sending out a clear statement – it underpins Clariant’s commitment to innovation, sustainability and profitable growth”, explains André Koltermann. Since 2006, the Group Biotechnology has successfully implemented projects in the field of renewable raw materials. The focus of this strategic unit is on the development of sustainable bio-based products and processes in the field of chemicals and biofuels. Clariant is a globally leading specialty chemicals company, based in Muttenz near Basel/Switzerland. On December 31, 2014 the company employed a total workforce of 17 003. In the financial year 2014, Clariant recorded sales of CHF 6.116 billion for its continuing businesses. The company reports in four business areas: Care Chemicals, Catalysis, Natural Resources, and Plastics & Coatings. Clariant’s corporate strategy is based on five pillars: increase profitability, reposition portfolio, add value with sustainability, foster innovation and R&D, and intensify growth. Clariant has four companies in Germany, one of which is the group’s largest worldwide – Clariant Produkte (Deutschland) GmbH. Around 4,500 employees in total work at Clariant’s companies in Germany. Operating at 16 locations, the German companies produce a wide range of chemical specialties comprising several thousand individual products. These play a decisive role in customers’ production and processing processes and offer qualities enhancing the value of their end products. The key to the facility was symbolically handed over to: Clariant CEO Hariolf Kottmann, Ilse Aigner, the Bavarian Minister for Economic Affairs, Media, Energy and Technology, the Head of Group Biotechnology André Koltermann, owner of the house Manfred Wander, Jens Stephan, Head of Services Group Biotechnology and Prof. Dr. Haralabos Zorbas, IBB Netzwerk GmbH (Left to right).